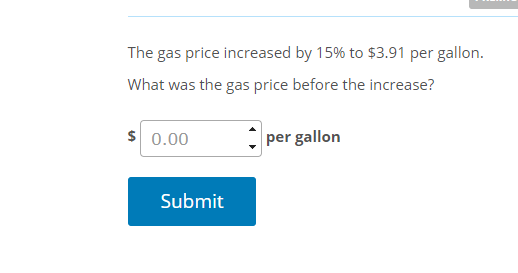 The new price of gas = 1.15 * old price of gas, so divide the new price by 1.15 to get the old price. $3.91 / 1.15 = $3.40. 1.15 is the equivalent of 115%, i.e. 100% (the original price) plus 15%. oh yes. I think I need to call it quits for today :) thanks , let me see.